When your roots are located in Finland and the calendar marks year 2006, then i) you lay on the 'extreme' side of Metal (even if you're a la CHILDREN OF BODOM melodies makes you a fave band for more 'polished' Metal fans), b) the 'well' of YNGWIE MALMSTEEN, STRATOVARIUS and SONATA ARTICA is your weapon for double-bass melodic Speed Euro Metal. Now, with a title like Hell Awaits in the tracklist - it is not, is it? - I was prepared to press button a but the audition clear things out. The Finnish quartet - for the time being, with two session bass players helping out as I can see - have already released a couple of albums and I can now recall the content of the 2001 Salvation By Fire debut. Neoclassical speedy Power (as said?) Metal with catchy melodies and a frozen spirit (the 'Suomi' land). 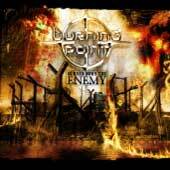 Now, with their third full-length release, BURNING POINT succeeds - or fail; you choose - in sounding like a mix of EDGUY and STRATOVARIUS. The Metal Heaven label welcomes another act that will possible bring in some extra cash from Northern Europe. The songwriting is excellent, the guitars are heavy with some 'prog' moves at times, the rhythm section is typical when not speeding up like hell and the vocals of Pete Ahonen are similar to Sammet's (EDGUY) singing throughout the 90% of the CD's duration. Good keys work ensures the volume in the CD while some better work could the band do in terms of the guitar sound in solos. Not to left 'em aside, the chorus in each song is a 'choir' one. Who does this remind me of (again)? Apart from the aforementioned names, you can imagine the rest for the genre that fits BURNING POINT's musical offer. The album is not bad at all. It surely is typical and has limited chances to gain some fame (I wish so, anyway) since the competition is ruthless in the melodic Euro Metal scene the last years. Will this band climb high enough? Others did not (NOCTURNAL RITES is a good example - and a better band).